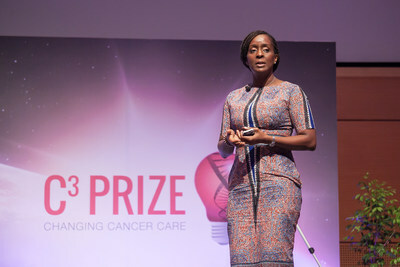 NORTHBROOK, Ill., Oct. 4, 2018 /PRNewswire/ -- Astellas Pharma US, Inc. today announced that Ebele Mbanugo of Lagos, Nigeria, Run For a Cure Africa Breast Cancer Foundation, has been chosen as the Grand Prize Winner of the third annual C3 Prize, a global challenge that supports non-treatment innovations aimed at improving the cancer care experience for patients, caregivers and their loved ones. Mbanugo will receive a $50,000 grant and mentoring to help bring to life her winning idea to transform cancer care. The other two Category Winners receive $25,000 grants. "The C3 Prize places a spotlight on trailblazing cancer care solutions and exemplifies the entrepreneurial spirit I am dedicated to supporting," said celebrity guest judge Bill Rancic. "As both an entrepreneur and the husband of someone affected by cancer, I can truly say that the grand prize winning idea has the potential to make a significant impact on people with cancer and their caregivers in low- and middle-income countries." Mbanugo's winning idea is to produce a culturally relevant and easy-to-understand digital audio series—the first of its kind—that addresses common myths and barriers to breast cancer treatment in Nigeria. With the grant money from the C3 Prize, she will bring together local actors and writers in-studio to create a pilot project that tests her prize-winning theory that the Nigerian penchant for good stories will make this entertaining and educational series a success. "I am thankful for the opportunity to make my idea—to change the way Nigerians learn and talk about breast cancer—a reality," Mbanugo said. "I've been dedicated to increasing access to cancer care since my mother and her two sisters were diagnosed with breast cancer. The idea I presented is the next step in my mission to fight breast cancer and help erase the stigma surrounding it, through education." Mbanugo pitched her idea alongside two other Category Winners to a panel of judges, including Rancic, to whom the topic of cancer is personal—his wife and fellow reality-TV star Giuliana was diagnosed with breast cancer in 2011. Congress attendees watched him and others choose a winner during the Union for International Cancer Control (UICC) World Cancer Congress in Kuala Lumpur, Malaysia on October 3. "We are pleased to support all three of this year's C3 Prize Category Winners, whose ideas have the potential to transform the cancer care experience," said Mark Reisenauer, senior vice president, Oncology Business Unit at Astellas. "Our past winners have already had a significant impact on the cancer community, and we are excited to see how this year's winning ideas may make a difference for patients, caregivers and their loved ones around the globe." Support Tools: Do Hyun Kim, of Cambridge, Massachusetts, USA, Harvard University. Kim and his classmates, including Emily Dahl and Olga Romanova, developed an outpatient wearable device designed to take body temperature readings of pediatric cancer patients at specific time intervals and alert them of the results via an alarm feedback system. Technology Tools: Richard Levenson, of Sacramento, California, USA, UC Davis Medical Center. Levenson developed an instrument that can provide enhanced, diagnostic-quality images directly and quickly from fresh or fixed tissue—changing the way cancer can be diagnosed. In addition to the prize money, all three Category Winners will receive a one-year "nights and weekends" membership to MATTER, a Chicago-based healthcare innovation community, to help bring their innovative ideas to life. The Astellas Oncology C3 (Changing Cancer Care) Prize is a global challenge focused on inspiring non-treatment ideas that may improve cancer care for patients and their loved ones. In its third year, entrants were challenged to come up with solutions that transform cancer care in low- and middle- income countries, whose populations bear a disproportionate burden of the global cancer epidemic.1,2,3 New for this year, applicants selected a category under which to submit their application. For more information on the specific categories visit C3Prize.com. Entries were evaluated based on the following criteria: extent to which idea reflects application category; plausibility of idea; creativity and originality of innovation; and ability of entrant to operationalize/implement the innovative idea for future application. Astellas is a pharmaceutical company dedicated to improving the health of people around the world through the provision of innovative and reliable pharmaceutical products. For more information on Astellas, please visit our website at http://www.astellas.us. You can also follow us on Twitter at @AstellasUS, Facebook at http://www.facebook.com/AstellasUS or LinkedIn at http://www.linkedin.com/company/astellas-pharma. The Union for International Cancer Control's (UICC) rapidly increasing membership base of over 1,000 organisations in more than 160 countries, represents the world's major cancer societies, ministries of health and patient groups and includes influential policy makers, researchers and experts in cancer prevention and control. UICC also boasts more than 50 strategic partners. The World Cancer Congress (WCC) is a recognized international conference which encourages effective knowledge transfer and best practices exchange amongst 3,500 cancer control and public health experts from 150 countries. It aims to strengthen the participants' action and impact on national, regional and international scales through a multidisciplinary program that features the latest successful interventions in cancer prevention, diagnosis, treatment and care. The Congress was awarded 'Best Conference Development' at the 2016 International & European Associations Awards and 'Best use of social media' at the 2017 Association Excellence Awards. The World Cancer Congress is an initiative of the Union for International Cancer Control (UICC) - which was recognized with Membership Engagement Award - and supports the organization's purpose statement 'to unite the cancer community, reduce the global cancer burden, promote greater equity and integrate cancer into the world's health and development agenda'. It takes place every two years in a different country and is hosted by a local member of UICC. MATTER, Chicago's premier healthcare collaborative, includes 200 cutting-edge startups from around the world, working together with hospitals and health systems, universities and industry-leading companies to build the future of healthcare. Together, the MATTER community is accelerating innovation, advancing care and improving lives. For more information, visit matter.health and follow @MATTERhealth. 1 Moten Asad, et al. Redefining global health priorities: Improving cancer care in developing settings. J Glob Health. 2014 Jun; 4(1). SOURCE Astellas Pharma US, Inc.